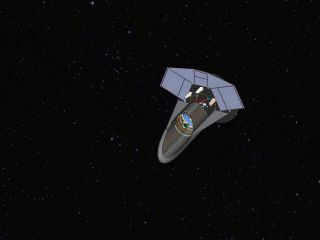 An artist's concept of the Fast INfrared Exoplanet Spectroscopy Survey Explorer (FINESSE), a proposed mission. AUSTIN, Texas — Now that astronomers have found more than 700 alien planets around other stars, it's time to get serious about characterizing what those planets are like, say scientists proposing a new telescope mission. The new spacecraft, called FINESSE (Fast Infrared Exoplanet Spectroscopy Survey Explorer), would study the atmospheres of 200 recently discovered exoplanets beyond the solar system. "We want to go beyond just knowing they're there," FINESSE co-investigator Pieter Deroo of NASA's Jet Propulsion Laboratory (JPL) in Pasadena, Calif., told SPACE.com. "We want to know what these planets are made of, and we're going to do this through spectroscopy of the atmosphere to not only probe the molecular constituents but also the temperature profile. We're not going to do this for one planet, but for a whole sample of planets to get the global picture of exoplanets." Deroo and the mission's principal investigator, Mark Swain of JPL, are here this week at the 219th meeting of the American Astronomical Society to spread the word about FINESSE's promise. The FINESSE space observatory would target planets in three different classes: terrestrials, including so-called "Super-Earth" planets slightly larger than Earth, as well as Neptune- and Jupiter-sized planets (called Neptunians and Jovians). In particular, the instrument would search for signs of particular chemicals in the planets' atmospheres, including water, methane, carbon dioxide and carbon monoxide. In September, FINESSE was selected by NASA as one of five potential missions worthy of further study for possible future "Explorer" missions. These missions would be capped at a total cost of $200 million, making them relatively inexpensive compared to other space missions. Of those five missions, three are related to heliophysics (the study of the sun) and two, including FINESSE, are astrophysics-focused. "The plan is that there will be one mission selected for astrophysics and one for heliophysics," Swain told SPACE.com in an email. FINESSE, if selected as an Explorer mission, would launch in 2016 and run for two years. Its aim would be not to find more new alien planets, but to better understand those that have already been found. "While finding new ones is obviously exciting too, it's like you have these Christmas presents under the Christmas tree, and you can't open them," Deroo said. "Your parents tell you wait until more come, and it's so unfair."